Catamaran Houseboats - training, experience and handling. Like to experience some real houseboat handling and training from behind the helm of a large catamaran houseboat? My wife and I have a 57 foot Carri Craft Catamaran Hulled houseboat. We live aboard in South West Florida. I have an idea and I'll run it past you to see if it floats. I was wondering if there would be a market for having potential future houseboaters travel with us for various peroids of time as kind of trainees. A way to get some experience in handling a large houseboat with us. Running a houseboat of this size is challenging and requires some serious knowledge of currents, wind, reaction time, helm response, and many other things that only being behind the helm will give you. With an experienced skipper standing next to you showing you the proper ways of docking, following channels, anchoring, reading the water, chart reading, plotting a course, reading the GPS, radar, learning radio procedures, bridge openings, and a hundred other things you can only get while behind the helm. It would be safer with an experienced helmsman standing beside you. We have traveled the intracoastal waterway from the northern Chesapeake to Texas. Houseboats like ours are very capable of going anywhere we want to go. This boat has traveled the Great Lakes, down the Mississippi and across the open Gulf, out to the Bahamas and hundreds of other ports of call. It is a very stable houseboat and any boat sales person who tells you that a houseboat like this is not sea worthy does not know what they are talking about. 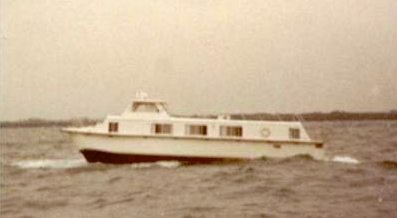 A little while ago I was reading something on this site about a boat broker who told someone that they should look into a trawler rather than a houseboat for traveling the lakes, rivers and inter-coastal. This person has most likely never been on a big, sea-worthy houseboat. Either that or he wants to make much more money by scaring someone into a much more expensive boat. Houseboats, nay, houseyachts are capable of a lot more than the general public is aware of. Only experience will teach you what your limitations are. You definately have to know the limitations of your particular boat and your own abilities. Nothing but getting out there and doing it will give you that knowledge. It is not all cruising and partying, there are breakdowns, everyday problems like with getting water, fuel or emptying the holding tanks. Don't forget, there are no plumbers at sea except you! There are good as well as bad things that go with houseyachts. Well, what do you think? Is it worth looking into offering sort of informal classes while we are traveling? It could turn into a kind of learning cruising vacation. Think of it, experience a large houseyacht without having to invest many thousands of dollars buying one that you may find out you don't like. Houseboating is definitely not for everyone. It may not be for you. How will you know? Just a thought, Russell, Florida. Well Russell, I want to say thank you for an excellent post and picture. You have a very sought after model of catamaran houseboat, and I can relate and agree with what you say about real-life boating experience. Theory is Theory, and Experience is Experience. In regards to your idea of offering real-life houseboat handling and training, well I think it is an excellent idea, and should almost be mandatory with any advanced boating class. I personally think that anybody contemplating purchasing a large houseboat should have access to some form of "hands-on" practical real-life experience, to truly absorb the feeling, size, and responsibilities. As to some of the business implications, I think you may have to look some of the small details like your insurance policy coverage, maybe the commercial vessel obligations, and how to attract a paying clientele. Do let me know if I can be of help or assistance. When it comes to educational and informational dvd's, the best ones that I found offer great tips on purchasing a houseboat, docking, handling, maintenance, repairs, and so many other topics that are priceless. The knowledge from videos is a small price to pay. Do you prefer Books? Are you a person who enjoys reading books and keep them for future reference? Have a look at the collection of boating lessons, tips and guides from our houseboat book section. 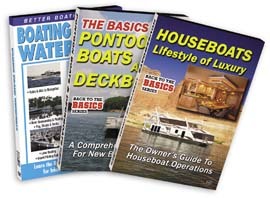 There's books and topics on docking, buying, building, handling, anchoring, and also First Mate 101 for your spouse. Lastly, hopefully some of our readers will share and post comments about their houseboat handling and training experiences. Feel free to use the "Click here to post comments." link found near the bottom of this page. Russell, I couldn't tell if this is a current post or not, but it is exactly what I did had in mind. I have wanted to buy and live on a boat for a very long time and I've told myself that I shouldn't because I'm single. I also worried that it wouldn't be everything I hoped for, so I was sure that this would be only a dream. If you're sincerely interested in showing the ropes to a newbie, I would love to discuss this. I look forward to a response soon. As a matter of fact, I would welcome any advice or suggestions from anyone who reads this. Thanks. Houseboat Training - when do we start? We are game...Thinking of living on board once we we retire. I have no boating experience though LOL... but this is what we want to do. What a wonderful idea! As I am just starting research for the purchase of a houseboat, finding information for classes and such has been very difficult. Go for it! It sound like a great idea to me. I've loved carri-craft for a very long time and dreamed of living on one. I even look at buying one a few times over the year but there was always something or someone to talk me out of it. But now things are different, the kids are grown my mothers gone so I don't have to here her tell me to grow up & my wife is ready too. I've been reading the houseboat blogs to & yours really inspires us. She likes when you talk about going up the east coast in summer & going south in the winter. I told her just last week how I'd like to pick your brain for info on carri-crafts. Back to experience it from behind the helm. There's a guy in Pensacola FL that does training on your boat or his but it's $195.00 a day + transportation fuel, food fuel fees etc. I'd have to save a longtime. I live in North Carolina but before I lived here I lived in the forida keys for 18 yrs. I have friends with large fishing boat that I have been behind the helm. Trying to find anyone who will spend time training new houseboaters is an impossibility. We have tried to find good videos and there are some - but beaching a houseboat on Lake Powell is entirely different then beaching in calm waters and tying up to a tree! No one has ever taken the time to really do a good video - explain to someone how to put a houseboat on a beach or even a dock or slip in a viscous wind storm. Try to show newbies, after the 10th try retrieving a speed boat in a wind storm - how to do it. There should be a video given with ever sale - a video on every houseboat - rental or bought that shows people how to work them. Every waterway is different, but basic techniques and maneuvers are always the same. You plan the trip - we'll bring the video and lets market something amoung us boaters. I have married kids now, and am at the point of wanting to take our houseboat out alone - which was our objective - but again, unless we go with them and teach all the time, there isn't any reference or resource material anywhere and then we wonder why people get beached, or worse, sank. Well Hydee, I can understand your frustration, and the best tip that I can recommend to you is to have a look at these boating videos & dvds.